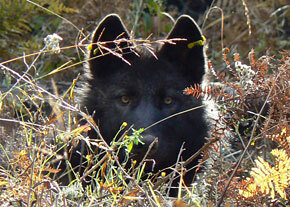 ODFW has this portrait on its web page devoted to wolves. In northeast Oregon’s Wallowa County on Thursday, state employees shot and killed four wolves to keep them from killing more livestock. That’s what happened, according to the news, but that’s not what officials and publicists called it. In a press release announcing the impending shootings, the Oregon Department of Fish and Wildlife said it had “confirmed five livestock depredation incidents on private land within the past three weeks by some wolves in the Imnaha pack…” Translation: Wolves had killed five calves or lambs or injured them so badly they had to be put down. Could we just describe things in plain English, please? “Lethally remove” is too vague a euphemism for “kill.” It could mean chasing the animals with helicopters until they expire from exhaustion. Or it could mean trapping them and then killing them in a cage with poison gas. “Enact lethal take”? And what had the wolves done? They had “committed five depredations.” Bad, bad wolves! Wolves killing livestock and then being killed in response are the predictable result of a conscious decision by wildlife officials some years ago reintroduce these predators in the wilds of Idaho, where wolves had been as extinct as they were in Oregon. Some of the wolves migrated to Oregon, where they have grown in number to the point where the state removed them from the list of endangered species, a decision the legislature has just confirmed. A couple of years ago the country was excitedly following the wanderings of a lone wolf from Oregon to California and back. And now we’re to the point where the state has to kill its relatives because, like all creatures, they like to eat. Let’s try not to be sentimental about this. We kill animals all the time – wild ones like crabs and fish and deer and domesticated ones raised for the very purpose of slaughter. If you had a burger at McDonald’s, as I did today, an animal was killed — after a short and mostly miserable life — to make it possible. So why the fuss over a few wolves? You’re absolutely correct. On the other hand the way we use words to describe things may be showing a “pack” mentality not removed from what the wolves do. Someone uses the phrase “lethally removed” and it can quickly become adopted by others, not by an edict (though that may happen from time to time) but because people naturally tend to follow others. Agree that language does evolve as needs and circumstances change. Consider: “clinical removal of fetal tissue” instead of “killing an unborn baby”? Says who? On what basis? But if it eases your your guilt pangs, call it something clinical-sounding. I’ll stick to the plain truth. No, it’s not. It happens in science, reporting, and writing in every discipline. Being “politically correct” and assuming everything is politically connected is what people like you do. It is all about fear… People want to hide what they are doing, using language to hide behind killing of no matter what, it’s killing. The only reason to use something else is so people won’t know what you are doing. When that is the case maybe you should look at what you are doing instead of hiding behind words. If you are unwilling to let people know that you are killing something, maybe, just maybe you are afraid of their reaction.